The 2008 issue of Proof Gold American Eagle Coins marked the first time in the program’s history that the 1 oz gold coin surpassed the 1/10 oz coin in demand. The coins in the 1 oz weight continue to be more popular than the 1/10 oz coin to this day with collectors of the Proof Gold American Eagle. 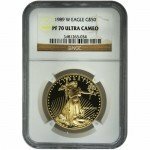 Right now, 2008 1 oz Proof Gold American Eagles are available to purchase online at Silver.com in perfect condition. 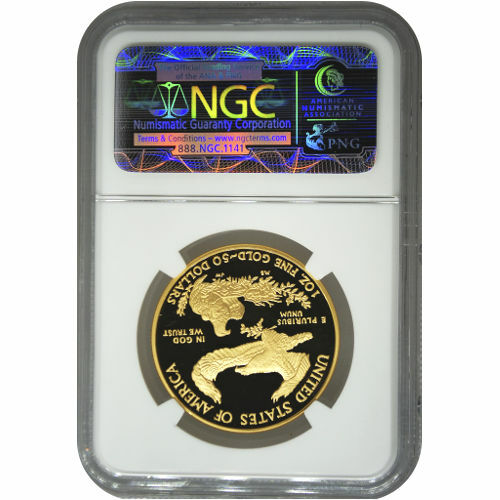 23rd release of the 1 oz Proof Gold American Eagle coins! Availability limited within the original 30,237-coin mintage! Lady Liberty is found on the coin’s obverse. American bald eagles are found on the coin’s reverse. 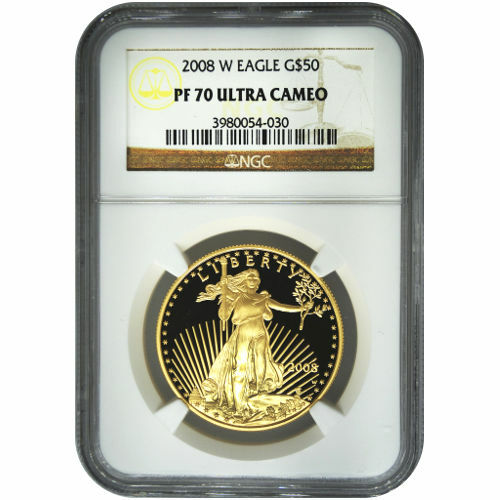 Each of the 2008 1 oz Proof Gold American Eagle Coins available in this product listing come with a PF70 certification from the NGC. Coins in this condition exhibit full, original mint luster with no detracting flaws visible on the design sets or background fields of the coin. The UCAM label included in your plastic slab indicates the coins are considered ultra-cameo specimens. The UCAM label means that each coin has strong, frosted design elements and deeply-mirrored, clear background fields. Mintage of the 2008 1 oz Proof Gold American Eagle Coin was down significantly, as it was for all of the coins in the collection. The 1 oz coin fell by more than 21,000 coins from the 2007 release and marked the third-largest drop in the series. Rising gold prices were largely responsible for the drop by pushing gold buyers to the bullion version of the coin. 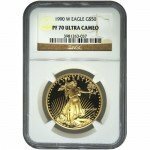 On the obverse face of 2008 Proof Gold American Eagles is the image of Lady Liberty. Created in 1907 by Augustus Saint-Gaudens, the image features a vision of Liberty that appeared on the $20 Gold Double Eagle until 1933. The reverse side of the 2008 1 oz Proof Gold Eagles depicts a family of bald eagles. This image was designed exclusively for the Gold American Eagle collection in 1986 and depicts a male, female, and young hatchling eagle. If you have any questions, don’t hesitate to reach out to Silver.com. You can call us at 888-989-7223, chat with us live online, or simply send us an email with your inquiries.